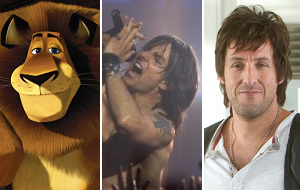 The animals of Madagascar 3 should have no problem fending off Tom Cruise as a rockstar and Adam Sandler as a degenerate father at the box office this coming weekend. Madagascar 3 is capitalizing on the fact that there has yet to be a true family-friendly release this summer. The Paramount/DreamWorks flick already has more than $150 million in the bank worldwide, and this weekend will help put it one step closer to matching the $604 million worldwide haul of 2008's Madagascar: Escape 2 Africa. An 83% combined approval rating from more than 61,000 Flixster user indicates that word-of-mouth is healthy. As of 4 p.m. PT, Fandango reports that Madagascar 3 accounts for 9% of daily sales. The Dark Knight Rises is overshadowing all other releases, but Fandango refrained from releasing the official number. Look for Madagascar 3 to grab $35 million during its sophomore frame. Rock of Ages director Adam Shankman has said that with Rock of Ages he wanted to make a musical that straight men would like. If he and his all-star cast have succeeded, RoA could turn into a solid counter-programming hit. Unfortunately, a very competitive marketplace will stop the Warner Bros. release from making too much noise during its opening. Oh, and disregard the fact that critics are trashing RoA—this one has "crowd pleaser" written all over it. Fandango reports that RoA accounts for 2% of daily sales—not bad considering the impact of TDKR. Expect Rock of Ages to open to $30.5 million from more than 3,350 locations. That's My Boy shouldn't be too far behind Rock of Ages. In fact, the R-rated comedy could end up beating the musical if Sandler enthusiasts aren't still feeling burned by Jack and Jill. The R-rating may bring older fans back to the fold, but it will also keep out teens. Co-star Andy Samberg should bring in a minor following of his own. Fandango reports that That's My Boy has yet to make a dent. That's My Boy looks poised for $28 million from around 3,000 locations. Rock of Ages Jun 15, 2012 Warner Bros. Welcome to this online platform where you people and windows 10 OS users will comes to know how to properly work http://gethelpwindows10.com with your desktop and learn every things about every features and advantages.